Assassin's Creed fans will soon be able to shank each other in glorious high definition. 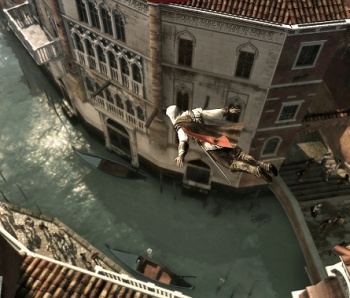 The next Assassin's Creed will return to Italy and Assassin's Creed II protagonist Ezio, taking him to the Holy City of Rome, where he will attack the Templar order directly. Among the new features announced is the multiplayer capability. While information on the multiplayer is scarce, Ubisoft has said the game will have an online versus mode and as a general rule, their new releases will also include a co-op mode of gameplay. Ubisoft further announced the third Assassin's Creed should be seeing a release no later than April 11, 2011. This comes with the release of Ubisoft's third quarter sales figures, with Assassin's Creed II shipping 8 million copies since its November release. To put things in perspective, the first Assassin's Creed sold that many copies in June 2009, eighteen months after release. With lessened earnings this fiscal quarter, Ubisoft definitely wants to capitalize on a strong franchise. And capitalize is exactly the way to describe what they're doing. Last week, Ubisoft announced another multiplayer Assassin's Creed game for the iPhone, following up with an announcement that the iPhone game was not going to be the multiplayer-capable sequel they had announced earlier. As far as Ubisoft is concerned, Assassin's Creed is one of their most valuable properties, but can they keep up the steam? We'll find out within the next year.